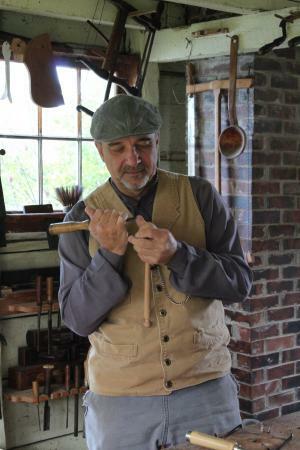 Interested in learning more about one of our Heritage Trades? Join us for a “Hands On” traditional artisans’ apprenticeship in an engaging and educational atmosphere? All workshops are held in July 4 – Oct 12 and are $125 plus HST for a five-hour experience. Please call 1-888-743-7845 to register. Interested in learning the traditional art of the forge in a fun and educational atmosphere? Join our “FIVE HOUR FORGE” at Sherbrooke Village. This day-long workshop runs every Thursday, Friday & Saturday from 10am-4pm from early July to mid-October. 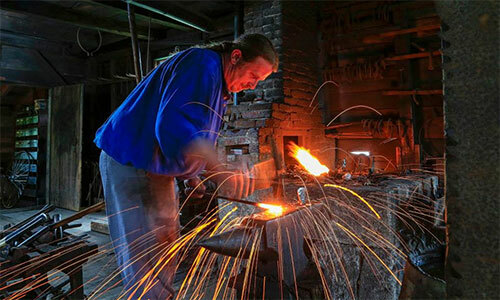 Participants will produce two forged pieces under the watchful eye of our Village Blacksmith. Cost is $125 + HST per person (materials included). Class sizes are limited to four participants per day and ages range from 9 to 90. Register now by calling (902) 522-2400 or 1-888-743-7845 and get your hands-on history! A spoon made with your own two hands is a fun and relaxing introduction to the fine art (and addictive hobby!) of wood carving. They can be carved almost anywhere using just a simple, sharp chisel & gouge. Under the guidance of our Woodturner/Chairmaker Joey Jordan, you’ll learn how to draw out your spoon shape, experience the process for turning the blank on the lathe, and the safe handling and use of carving tools as you pair down your creation, hollow out the bowl and hand whittle the spoon’s final form and shape. Ages 9-90 are welcome! If participants are under 16, they must be accompanied by an adult. Class size is limited to 2 people per day and run every Thursday, Friday and Saturday from 10am-4pm. Cost is $125 + HST (materials included). Register now by calling 902-522-2400 or 1-800-743-7845 and get your hands-on history! Kick and throw! Our potter, Krista Gunn will surely feed your creative spirit during this day long experience. 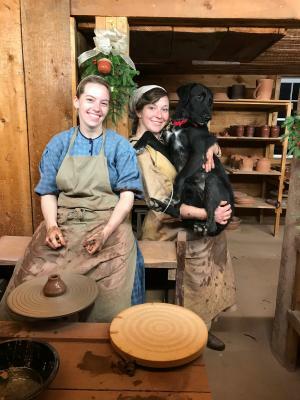 You will learn to wedge clay and to center it on the wheel and then make cylinders into bowls, cups, or other little treasures. You won’t soon forget the satisfying feel of clay on your fingers, cakes of mud on your apron, and the pride of creating something beautiful with your own two hands. Classes are offered daily on Thursday, Friday & Saturday from 10am-4pm from early July through to mid-October. Ages 9-90 are welcome! Cost is $125+ HST (materials included). Your treasured pieces will be ready for pick up just as soon as they are kiln fired & dried in a few weeks after your course. Register now by calling (902) 522-2400 or 1-888-743-7845 and get your hands-on history! Back in the 1800’s, it took 7 long years to become a Master Printer. Here at Sherbrooke Village, we have one of our very own, and you can be her “Printer’s Devil” for the day! 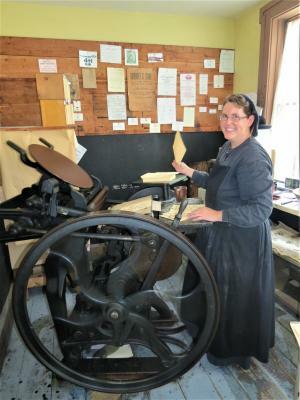 Patty-Lou will help you dress the part, learn to type set, cut paper using 150-year-old print cutter, and run the foot powered print press, creating memories and souvenirs that will last a lifetime. Will it be a favorite recipe from the Printer’s galley, personalized party invitations, or your own unique business cards that YOU made with your own two hands? The hustle and bustle of the print shop near the river with the cozy feeling of the woodstove inside is surely a place you’ll enjoy spending your day! Classes are offered Thursday, Friday and Saturday from early July to mid-October, a maximum of 4 apprentices per class aged 9-90! Cost is $125 + HST (all materials provided). Register now by calling (902) 522-2400 or 1-888-743-7845 and get your hands-on history!